Despite the promise of "rich caramel flavor" and pictures of caramel candies on the box, this cereal doesn't taste that much like caramel. The flavor is more like burnt sugar with a slightly bitter aftertaste. I'm a fan of most Cheerios varieties, so I was surprised that this cereal tasted more like Cookie-Crisp than any previous incarnation of Cheerios. 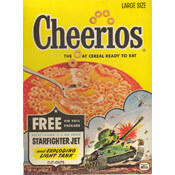 To its credit, the cereal tastes very, very sweet dispute having a fairly low sugar content of 6 grams per serving. It's not a horrible cereal. It's just not very good. I predict that most people who try it won't be going back for a second box. If you see this one at the store, my advice is to reach over a foot or two and choose Original or Honey Nut Cheerios instead. They are far superior. Nutritional Considerations: Each 3/4 cup serving has 100 calories, 1.5 grams total fat (0 saturated and 0 trans), 0 mg cholesterol, 22 grams total carbs, 2 grams dietary fiber, 6 grams sugar and 2 grams protein. 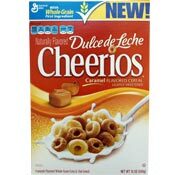 What do you think of Dulce De Leche Cheerios? Can't find Dulce de Leche flavored Cheerios in my local stores. Is it still being produced? I really hope so! Love it! One of my favorite flavors! I was so disappointed when they discontinued it. I found this cereal to be understated with great taste. Too bad it is no longer available to purchase in stores. This caused me to return to brands other than Cheerios. This flavor was okay. To me, it tasted exactly like Kix. Finished the box, but wouldn't voluntarily buy again. The new Peanut Butter Cheerios have better flavor and are amazing. I agree that it lacks actual caramel taste, but I do think it's a good sweetened cereal. I've bought three boxes so far, and I'm not disappointed at all. Saw these in the store on sale and gave them a try. Took a handful out of the bowl as I poured, and the initial flavor was really good, but sadly gave way to a chemical and fake after-taste. The rest of the bowl was disappointing. I love caramel, but didn't like this cereal at all. The peanut butter version is really good. It loses a bit of its punch in milk but otherwise it has a slight toasted peanut butter flavor. In my opinion it is a lot better than PB Captain Crunch. Now bring back Peanut Butter Toast Crunch already! I'm eating this right now and I agree its just ok, but the new Peanut Butter flavor is awesome. Now I don't feel like trying this cereal. Will you test the Peanut Butter Cheerios?